PrecisionHawk, Inc., a leading provider of drone technology for the enterprise, today announced that it has purchased Uplift Data Partners. Uplift specializes in the delivery of turnkey inspection services for construction, building information management (BIM) and real-estate. Uplift has provided drone services for leading national and global brands. Uplift’s nationwide network of commercially trained drone pilots will join PrecisionHawk’s Droners.io network of over 15,000 drone pilots, one of the largest networks of its kind. Suzanne El-Moursi, CEO of Uplift, will join PrecisionHawk’s executive leadership team managing the company’s construction line of business. “PrecisionHawk is leading the commercial drone market by combining superior technology with deep expertise in the markets that they serve. 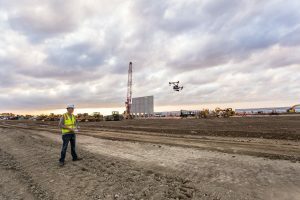 Through this acquisition, Clayco customers gain access to a new level of technological sophistication for more scalable and robust operations, while continuing to benefit from Uplift’s deep understanding of the demanding nature of engineering and construction industry drone missions,” said Clayco CEO, Bob Clark. This is the fifth acquisition for PrecisionHawk in 2018. Early acquisitions include Droners.io and Airvid. In September it purchased both HAZON, Inc. and InspecTools Inc., which specialize in the delivery of inspection services and technology for the energy industry. Their integration with PrecisionHawk has created dynamic synergy, providing solutions that elevate airborne intelligence and strengthen the data value chain for the enterprise. Similar to the energy space, the construction industry has experienced a rapid uptake in the adoption of commercial drone technology. Drones are now one of the leading innovative technologies that are transforming the construction process since they decrease the need for lengthy visual inspections, reduce planning time, improve worker safety and identify problems.